Even at 88 years old, Heinrich Villiger, chairman of Swiss company Villiger Söhne AG, is very active in many facets of the cigar business. Slender and soft spoken, Heinrich Villiger may be one of the most formidable players in the cigar industry. He owns Villiger Söhne AG, a massive cigar operation based in Pfeffikon, Switzerland that produces more than a billion dry cured, European-style cigars every year. He is the exclusive importer and distributor of Cuban cigars to five countries in Europe. 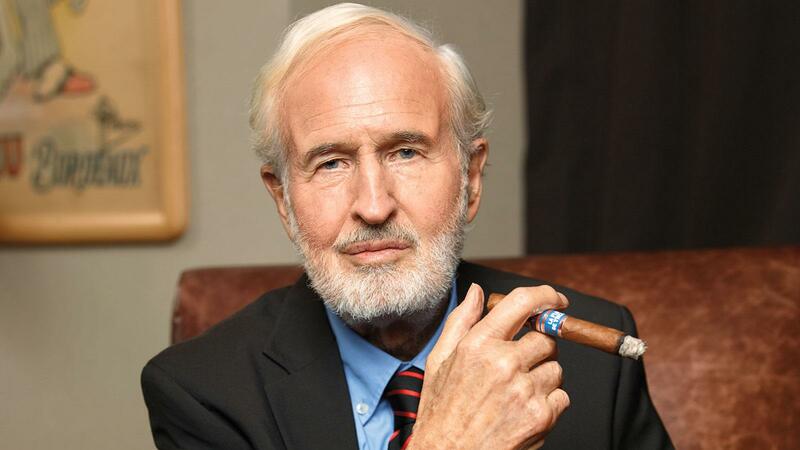 And he owns a growing portfolio of premium cigar brands sold in the United States, most notably Villiger La Flor de Ynclan, which was named the No. 10 Cigar of the Year in 2017 by this magazine. Cigar Aficionado: How did you get started in the business? Villiger: My grandfather started the company in 1888. He was in charge of finance for one of the big cheroot companies. Then he decided to open a cigar factory himself, and he became independent. His boss gave him a credit to start his own company. In 1902 he died when he was 42, so my grandmother managed the company for about 16 years until my father and my uncle continued, but my uncle had no children so my uncle sold his shares to my father. And my father and myself continued together until my father passed away. I was the only shareholder. Q: What did you do in your earliest days in the business? A: There were auctions for cigarette and cigar tobacco, not anymore for cigars, but the auctioneering was very quick, and there was a little sign if you wanted to buy one basket of tobacco, was maybe a hundred pounds, 200 pounds. The farmers usually put the good quality on top and the low quality inside, and my job was to follow the auctions. I’d lift up the tobacco, pull it out, put it on the top and compare the quality. If it was not the same, I could tear up the ticket. Q: So it was tobacco that you had already purchased by bid but after you inspected it, you could cancel the bid? A: Yes, cancel the bid. I had all the farmers on my back. I came with my schooling from Switzerland. They didn’t understand me. I didn’t understand the farmers with their slang. But I did this for a whole season. Then I was sorting Connecticut Shade in Hartford, and then I sorted broadleaf tobacco in Massachusetts. To learn, we have to do the work. That’s how I started. Q: What year was this? A: It was 1951. The auction was for flue-cured tobacco in South Carolina, North Carolina. Then, in winter, came the burley, the Kentucky. We bought a lot of dark-fired Kentucky. Then it got too expensive and we bought dark-fired tobaccos in Malawi. Malawi’s economy depends on tobacco. Q: Were you exporting Villiger cigars to the U.S. at the time? A: Shortly after World War II we started to export our machine-made cigars to the U.S. We had an importer in New York. Many American soldiers knew our products from their sojourns in Germany. Q: Do you use tobacco from Malawi for your Villiger dry-cured product? A: Yes. You need a lot of wood to dry it, to cure it. We buy a lot, we need it. Last year we made 1.5 billion units, so we need a lot of tobacco. Q: Where is your biggest market? A: Germany. Our German market share is maybe around 70 percent. Q: You must have to buy enormous amounts of tobacco. A: We buy a lot from many countries. We buy a lot of tobacco from Cuba, but Cuba has always been exporting leaf. It’s good tobacco, it’s good leaf. We buy from the south, we buy from Vuelta Abajo—that’s in the west part of the island—and we buy also from the east part. Q: Villiger has a long relationship with Cuba, and as you said, you use Cuban tobacco in some of your machine-made cigars. Can you describe how that relationship began? A: Cuban leaf tobacco is considered as one of the best cigar tobaccos in the world. But since the establishment of our company by my grandfather in 1888, we were and are using Cuban leaf tobacco in a substantial part of our different [machine-made] blends. The most important buyer of Cuban leaf, and also Cuban cigars, in the past has always been the United States. Q: But that’s no longer the case. A: Things changed dramatically when the U.S. enacted the embargo against Cuba. From one day to another Cuba lost its most important market. Then Cuban delegates from Cubatabaco started touring around the world looking for new markets. They came also to see us and presented the high quality of their leaf, grades which were not known to us before. They invited me to visit Cuba and to inspect their tobacco in their processing plants and warehouses. And they offered good prices. This was the beginning of our relationship with Cuba. We increased substantially the share of Cuban tobacco in all our blends and became one of the largest buyers of Cuban tobacco. Q: You don’t put Cuban tobacco in your premium cigars, do you? Or anything that comes to the U.S.? 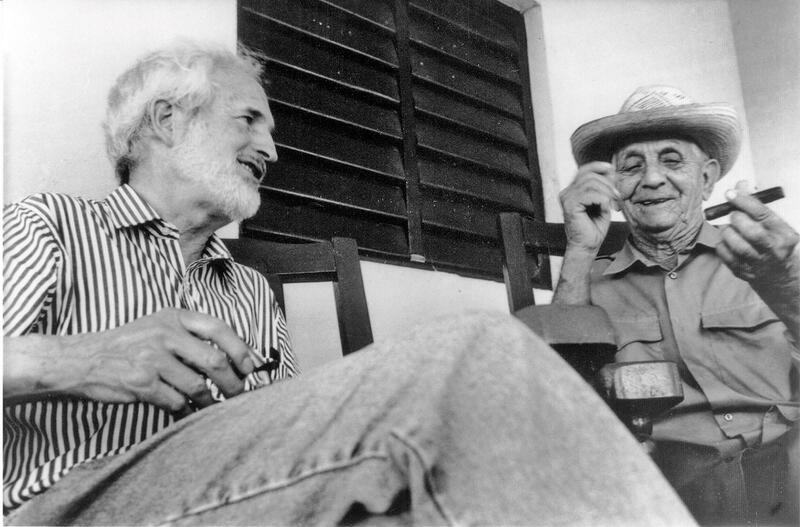 Villiger with legendary grower Alejandro Robaina on the porch of his Cuban farmhouse. Q: In addition to your own cigar manufacturing company, you import and distribute Cuban cigars in Europe. How many countries do you distribute Cuban cigars to? A: We have two companies with Habanos. One in Switzerland, that’s Intertabak. Then we have 5th Avenue in Germany. Q: How did that come about? Q: How did you do it? A: I recommended we make a mail-order catalog business with luxury goods—the best cigars, the best watches, Swiss watches—so, in 1976 we added to our mass-production business a 40-page catalog of all luxury products. And then we needed a name for this organization, and the most famous street for luxury products was 5th Avenue [in New York]. So we called this organization 5th Avenue Tobacco Gallery. We had cigars, we had pipes, pipe tobacco, the best of the best. Q: Were you doing business directly with Habanos at that time? A: No. That was only for us. But then Habanos had a president named Francisco Padrón. I think he was the first president of Cubatabaco. Padrón came to me and said, “Look, we have a problem, we have taken over all those private companies.” Each country had four or five distributors for Cuban cigars—one for Partagás, one for Montecristo, and so on—and he said that logistically that was a problem. Q: How many Cuban cigar distributors were in Germany at the time? Q: Habanos wanted 50 percent of the distribution? Q: What year was 5th Avenue established as the sole importer for Cuban cigars in Germany? A: I think it was 1989. Q: And Intertabak distributes to Switzerland. Do you own Intertabak too? A: The idea of Padrón was 50-50. In Switzerland, it was 50 percent Habanos, but what about the other 50 percent? He said, “I have another friend, another good friend in Switzerland, the Levy family.” It’s a family in Geneva. Very nice people. So in Switzerland, we have 25 percent, and Levy has 25 percent. Better 25 than nothing. 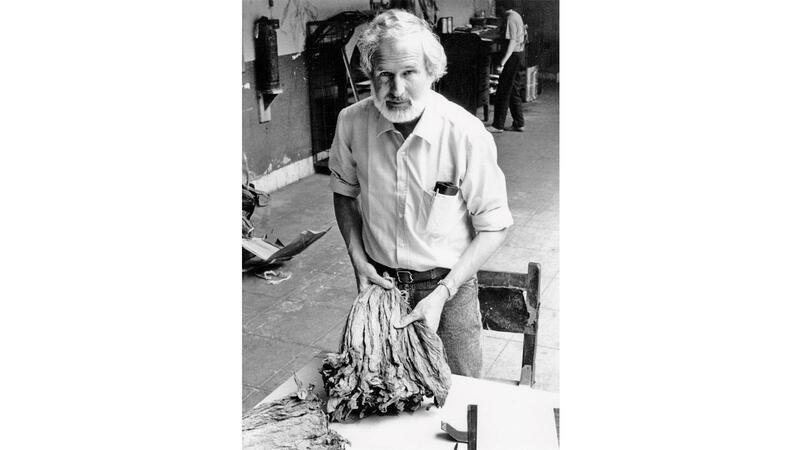 Villiger inspects tobacco in Cuba, circa 1988. Q: As a distributor, you sell to the tobacconists, including the La Casa del Habano shops? A: Yes, and the Casa has everything. The Casa must have the whole range. We are short on the special editions and limited editions, but the Casas have them. The Casas have priority. Q: You say you are short on special editions, but I remember you mentioning that you got 10 of those expensive Cohiba humidors, those big, 50th Anniversary humidors with the gold-leaf panels. A: We sold 10. The retail price was 195,000 euros each ($228,000). That’s for 50 cigars. You buy, of course, the humidor. It’s a beautiful piece of furniture. Q: Did you sell these humidors to any private collectors? A: No. Just to the Casas del Habano. Q: There’s a rumor that some countries get preferential treatment and receive better quality cigars from Cuba than others. Have you found this to be true? A: I am convinced that this rumor is not correct. Cuban cigars are sold worldwide with the same quality. The origin of presumed quality differences may come from inappropriate storage without enough ventilation and humidity. Q: Tell me more about your first premium brand for Villiger, because that’s a rather new venture given the company’s long history. A: The first premium brand was from Matias Maragoto [owner of the ABAM factory in Santo Domingo, Dominican Republic]. I had a very good friend and he died a few years ago, Alfredo Perez, the owner of A.S.P. I asked if he could recommend a good company, and he recommended Matias. It’s a nice factory. It’s like a subsidiary, but we have no interest in the company. Q: What was the name of the brand? 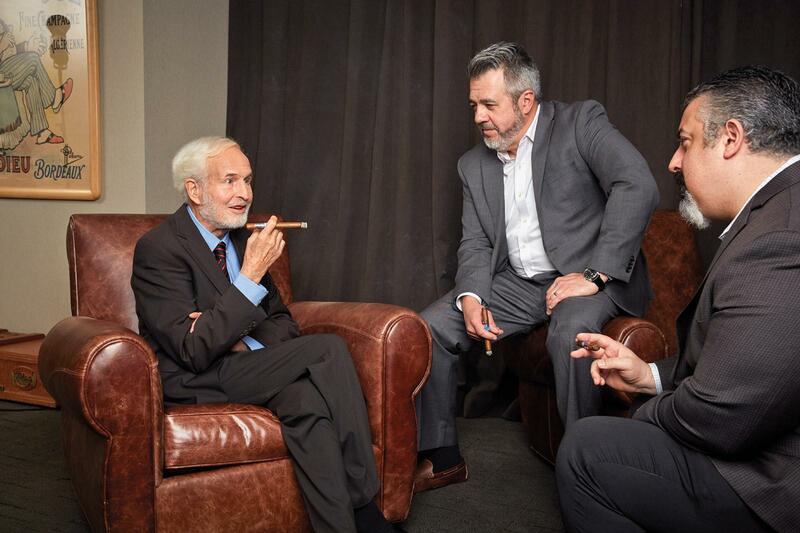 Heinrich Villiger shares stories with executive editor David Savona and senior editor Greg Mottola. Q:Wasn't Bock sold only in Europe? Q: What year did you launch Bock? A: In 1998, in Germany and Switzerland. Q: What about the other premium cigars that you sell in Europe? A: We also have cigars from Nicaragua. We have San’Doro. It’s a Latin name for the tobacco plant. The ships went to India and came back with tobacco, and this was the name. I created San’Doro. You have San’ Doro from Nicaragua and one from Brazil. We started in Brazil many years ago. We called the company Tobajara, but nobody knew what that meant, so we changed our brands from Tobajara to Villiger do Brazil. Q: Did you find it difficult to sell non-Cuban premium cigars in Europe? A: Yes, because the Cubans—Montecristo, Partagás—had been on the market for 100 years. Nobody knows the new brands, so the new brand must have a story. The smoker wants to know the history of the brand. Q: What are your observations on the U.S. premium cigar market? A: It’s a big market, and it’s increasing. And, you know, last year, Nicaragua was No. 1. Some big European companies are coming now to Nicaragua too, like Vandermarliere, the Belgians who own and import Oliva. Oliva was then sold to Vandermarliere. Vandermarliere is quite aggressive. Q: Isn’t J. Cortez the company? A: Yes, J. Cortez, but the family’s name is Vandermarliere. They are one of our biggest competitors [for machine-made cigars]. They are very strong in France, but we have had bad luck in France. We have very little market share in France. It is a problematic market. Q: In 2016, when you opened up your U.S. headquarters in Florida, you told us that machine-made cigars were 99 percent of your business, but that you hoped it would grow. So here we are, two years later. A: Well of course, now it’s more. Our core business is still the production of machine-made small cigars and cheroots. In value, the machine-made share is around 85 percent of our sales, the remaining 15 percent are handmade. Q: From 1 percent of the business to 14—that’s quite a change. How many premium cigars do you sell to the U.S. each year? A: We sold approximately 1.2 million premium cigars during the first six months of this year in the U.S. market. Q: The Villiger Flor de Ynclan was named the No. 10 Cigar of the Year by Cigar Aficionado for 2017. How has the U.S. market responded to Villiger’s premium cigars like Flor de Ynclan? A: We are satisfied with the reaction of the U.S. cigar trade and the U.S. cigar smokers to our range of premium cigars. They were, without exception, positive. This compliment is also due to the manufacturers of our cigars in the Dominican Republic and in Central America. Q: What is your best-selling premium cigar brand? A: The best sellers differ from one country to another. In the U.S. it is La Flor de Ynclan. Q: Do you have children in the business? A: I have on the board a daughter. She’s a doctor in medicine. I have just elected on the board a grandson. I hope that we can keep it in the family. Villiger is privately owned. All shares are held by the family. Q: Of all the premium cigars that you make, which is your personal favorite? A: I very much like the Villiger San’Doro from Brazil. It’s a Brazilian puro. Brazil has good tobacco. Q: Given your success with machine-made cigars, why did you enter premium? A: I believe in the premium cigar. There is potential for the category to grow. But usually you do what you like yourself. And I smoke only premium cigars. Q: That was your incentive? Because you like to smoke premium cigars? A: Yes. Because I like them. You should do in your life what you like. I started to work in our company at the age of 20 in the year 1950, that is 68 years ago, all fascinating. The most significant change is the success story of the premium cigar. Q&A: Carson Serino, Serino Cigar Co.
Indiana Ortez is a young Nicaraguan cigarmaker with a passion for social media marketing.